TAWAU, April 28 (Bernama) -- Sabah Assistant Minister of Resource Development and Information Technology Datuk Hamisa Samat has called on university students to be proactive and smart in using their rights and freedom to enter politics. KOTA KINABALU, April 25 (Bernama) -- Universiti Malaysia Sabah (UMS) and the Malaysian National News Agency (Bernama) today broke new ground by officially opening the Stock Lab at the university's Faculty of Business Economics and Accounting Friday. SINTOK -- Lebih 1,000 mahasiswa dan mahasiswi Universiti Utara Malaysia (UUM) berhimpun di Dewan Tan Sri Othman di sini, Selasa, untuk menyaksikan persembahan amal #RRCS4RRYC yang dianjurkan secara bersama oleh Majlis AIDS Malaysia. By Wan Asmanizan Wan Ahmad Najib KUALA LUMPUR -- Teach For Malaysia Week (TFMW) once again returns in year three with the same concept to feature many public figures and leaders to join hands in the objective to inspire and be inspired. KUALA LUMPUR --Eighty-four per cent of 90 talented business students from leading universities in 23 different countries said they were prepared to move regularly for the right job. ARAU, April 11 (Bernama) -- Universiti Malaysia Perlis (UniMAP) has become the second university in Malaysia to receive the 3-star QS Stars rating by the London-based world varsities rating agency, QS Intelligence Unit. 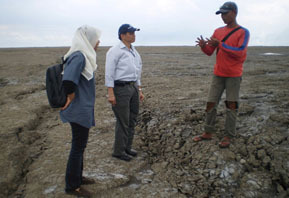 By Adnan Jahaya KUALA LUMPUR (Bernama) -- The mud and steaming hot water that squirted up from the belly of the earth in Sidoarjo, Indonesia on May 29, 2006, marked the birth of the world's most destructive mud volcano.